Claire Roth, expert Degas art reproducer and aspiring painter of original works, is approached by gallery owner Aiden Markel to paint a copy of a Degas masterwork. It would be business as usual for Claire, if only the painting wasn't the one stolen in the infamous 1990 Gardner Heist. But is the painting *really* the one painted by Degas? And will Claire and Aiden get away with switching one painting out for another? 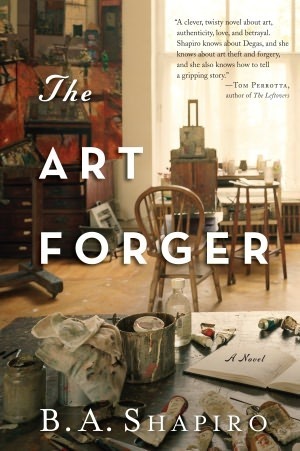 Setting the very dodgy art history in this book aside–which I'm willing to recognize few besides myself would care about–The Art Forger had some major narrative issues that prevented me from thoroughly enjoying it. First and least of all, The Art Forger is a bit predictable and some plot points rely way too heavily on convenient coincidences. For example, Claire's only friends include a curator at the Isabella Stewart Gardner Museum, plus a lawyer with a passion for art. You can see where this is going, can't you friends? Hint hint: the curator will intervene on her behalf and the lawyer will keep her case from turning into the next Netflix true crime documentary series. Secondly and more annoyingly, the plausibility issues were occasionally mind-boggling. The one I kept getting stuck on was that she approaches her curator friend with the story that: 1., the recently returned Degas painting is a copy that she painted; and 2. that she thinks the "real" Degas is hidden in a museum sub-basement. This is not suspicious in and of itself, but given that said curator friend knows she's been shacking up with the man recently arrested for selling the stolen Degas painting, I find it incredible he didn't add two and two and come up with THEY WERE IN ON IT TOGETHER. I mean, that's a pretty odd coincidence, no? Yet instead of exhibiting natural skepticism, he swallows Claire's story whole and winds up endangering his job–something I can tell you for a fact is NOT easy to come by–by letting her into the museum after hours. Don't even get me started. Another point that made my brain hurt was Claire's belief that if she found this mythical "real" Degas painting, Aiden will no longer be charged with selling stolen goods. OKAY, BUT WHAT???? Just because the stolen painting wasn't a real Degas doesn't mean Aiden didn't sell stolen goods. It was still the painting that was stolen from the Gardner. Whether it's a Degas or a Dr Seuss isn't really relevant to the question of his guilt or lack thereof. Not to mention there's this whole thing about intent and, since far as Aiden was concerned the painting WAS a real Degas, and he did fully intended to make money off it, you can't really argue he's not guilty. Unless you're delusional, have never watched TV, and can't be bothered to read up on basic US laws. Finally, there's a whole bunch of pointless, boring stuff. Tip: go ahead and just skip over Belle Gardner's letters. The characters sum up what they were about for you at the very end of the book, which is handy. The scenes in the prison, which I imagine were supposed to make Claire seem like not quite as much of a greedy sad sack with a broken moral compass, were simply irritating; and the flashbacks to her contretemps over her first forgery didn't impress me with her emotional maturity or intelligence. Basically, I found this book to be pretty difficult to buy into. Maybe I just know too much about art, but I'd like to think whatever knowledge I posses or don't wouldn't matter with an author who does their homework and takes the time to establish character motivation. And besides, at least half of the stuff that bothered me wasn't about art at all. I did enjoy Xe Sands narration on the audio, but I probably won't be checking out any of Shapiro's other books.